’Inchy’ sore and leaking a little blood. Down and got laptop started and made a cuppa. Chest pains started, angina not good. Feeling a bit down again. Despite Lynton emailing me that he is coming over to see me with his son next week. Did the LOMM update posts and some graphics for Troll Free Zone. Waiting for the Asda delivery, then I’ll get washed shaved teggies and WC then get changed to go to the Queens Medical Centre for my INT level tests. When I came down from ablutionising (Is there such a word?) my left thumb was bleeding from all around the nail! No pain, no lesions? I took some bits with me for the Nottingham Hospice Charity Shop to drop off on the way back from the Queens Medical Centre. I set off and caught the bus (Raining you see) into town. 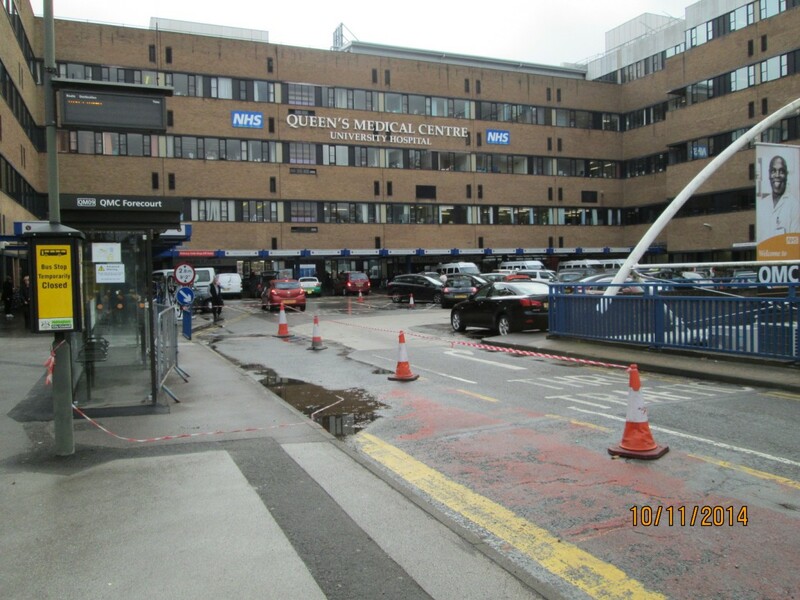 Then got another out to the QMC. The rain has lessened as I arrived at the hospital. Only a couple waiting at the haematology dep’t, and I was in five minutes later. There was only two staff on. The new girl and a bloke brought in from another department – three staff off today she said! She also pointed out that i had blood coming from my left ear-hole? Still she was happy could she could have first pick of the nibbles I took for them, including the fresh cream éclairs that tickled her fancy. I was soon out and caught a bus into town. Had a walk about a bit, got some DVD’s to add to the stuff got the Hospice shop. 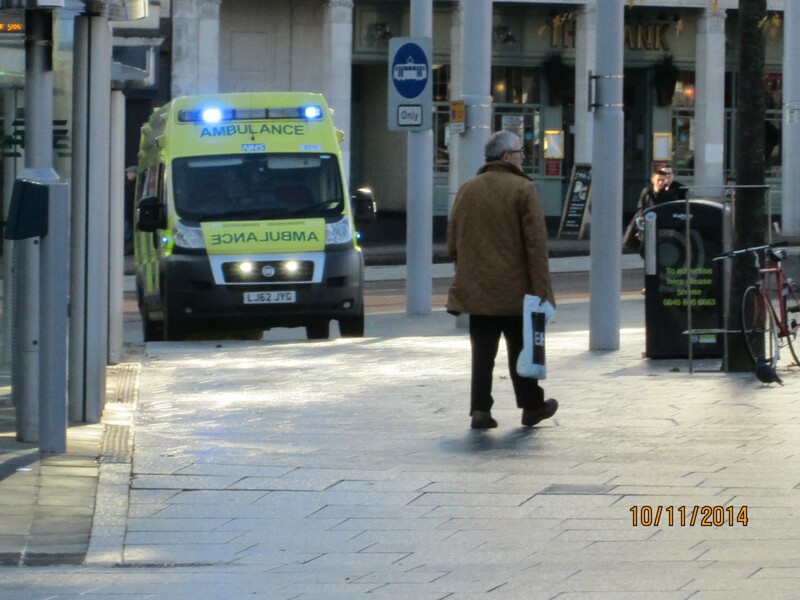 Ambulance/CityWalked into town and as I rounded the corner, the first thing I saw was somebody being loaded into an ambulance. That cheered me up no end. The rain had stopped and the sunshine glistened. 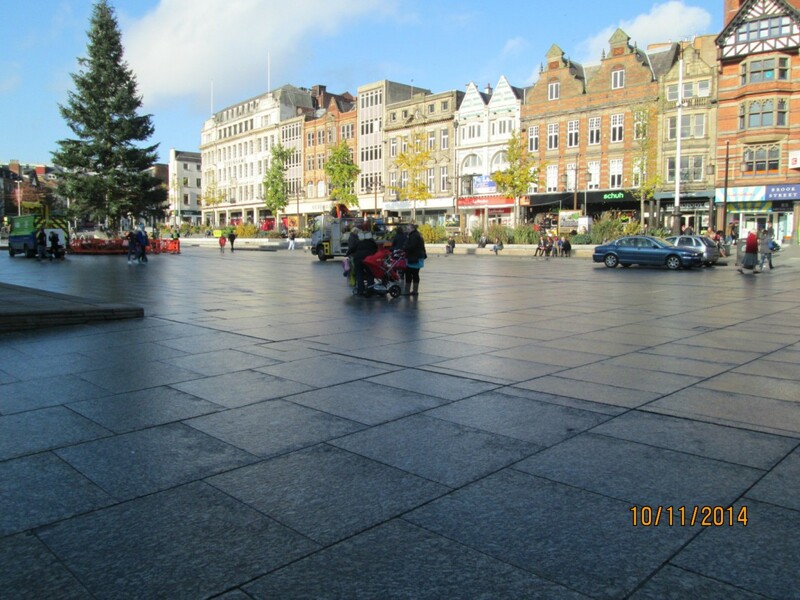 So I took a photo in the slab square. Then walked towards the Sherwood bus pick-up point taking a photo pf an alley as I passed it. 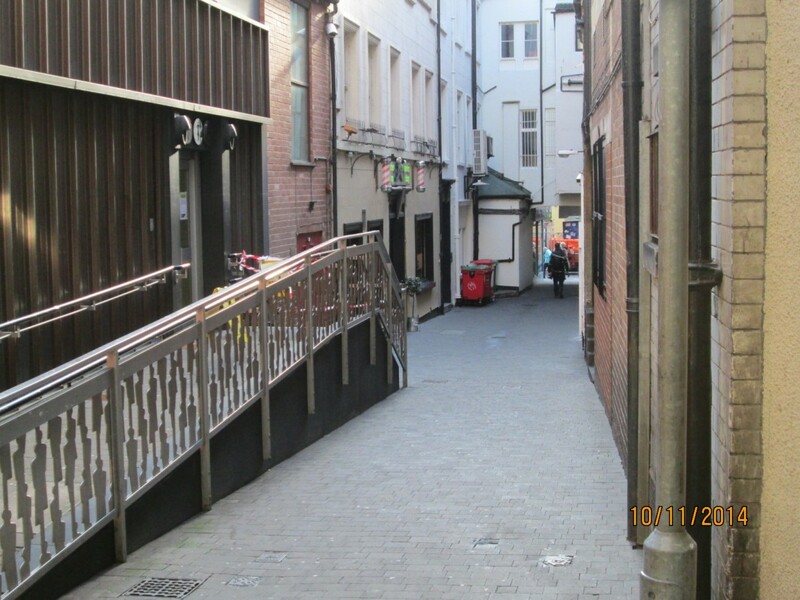 In this alley is a Barbers, a public convenience, a ladies hair dressers and a few other retailer. Not doing so well I’d hazard a guess by the lack of people around. I caught the bus and dropped off almost opposite the Charity shop and took the bit in for them. Then I had a walk back to Carrington, the angina still bothersome. And I foolishly didn’t put any Phorpain gel on my knees cause they seemed okay at the time – When will I ever learn! Nearly got ran into by a burke on a bike on the pavement as I turned the corner into my street. Laptop on and made a cuppa. It’s colder in this house than outside! Huh! Felt that warm wet sensation in the region of my little Inch again, went up and checked. Bleeding. A good day for me bleeding today innit – me left thumb, me left ear and now my ‘Inch’ has started again. I checked the ear-hole closer and I think the wax or ear-drops might have hardened and when I put me hearing-aids in it might have caught it and pulled a bit off? I’m looking forward to be nosh tonight (and hoping it come out alright like). I’ve got two big potatoes to do int microwave, then I’ll empty the flesh into bowl and bash it up with some cheese granules a splash of vinegar and a tad of sea salt, then return it to the microwave add some bbq sausages and rewarm it. I’ll let yer know how it turns out later. I might have a bit of cooked beetroot with it. Egon Ronay? Huh!